Can you tell us a little bit of your background and how did you get to where you are now? I am board certified in internal medicine I practiced internal medicine for 15 years but switched to a 100% cosmetic practice in 2008. I had about a two year transition period when I did both, but eventually turned over all my medical patients to a colleague and started concentrating full time on my cosmetic practice. I am calling my clinic a medical spa because we do offer facials and plan to offer massages as well. I start my day at 9 am and schedule patients until 6 pm. I have two late nights where I schedule until 7pm. I work half a day an Saturdays. I am the only physician in the practice and I have an esthetician as well as two medical technicians. Most of my staff are former patients. I never had much luck with online or print help wanted approach. How successful is your marketing campaign? What have you found that works? What hasn’t? I advertise consistently in one magazine ½ to full page. This magazine is distributed to higher income households in my target area. I tried radio and newspapers but did not have much luck in attracting the type of clientele I am looking for. I use Constant Contact to put out a newsletter and offers about twice a month. The email marketing has been very successful. We have a Facebook page and Twitter account but these have not been a significant source of new clients. Do you have any procedures that you like better than others? Have you dropped any treatments? If so, why? My favorite treatments are dermal fillers and fat transfers. I stopped marketing acne treatment because acne is more of a medical problem rather than cosmetic, I now refer these clients to a dermatologist. You offer treatments with fat transfer. Where have you seen the most success with this treatment? What have you learned about getting the most benefit from this? Do you have any special techniques or 'tricks' that you use? I offer a full face fat transfer. I like to fill the whole face starting from the hair line and temples to cheeks, nasal labial folds and pre-jowel sulcus. I use the Viafill system and mix platelet rich plasma with the fat for better viability. Can you share your experience with fat transfer? How would you describe the efficacy and results? Where have been the most successful improvements in keeping the fat alive after transfer? By using a disposable coated cannula to harvest and inject the fat and mixing the fat with PRP, I have been able to get good uniform fat retention. The fat is centrifuged using the Viafill system. What are your thoughts about the technologies you’re using now such as Smart Lipo and Ulthera? Smartlipo is a good system because it is a very recognized name, but the machine is very expensive with high disposable costs. If I was to do it again, I would have bought the Vaser for half the price. Ulthera was a moneymaker for me the first two years but now, I am having a difficult time with competition undercutting me on price. Everyone seems to have one these days including the gym across the street. The consumable cost on the Ulthera is also very very high. I recently purchased the THermiRF system. This one was a home run because the price of the device is very reasonable and the consumable cost is very low. I use this device for stand alone skin tightening and in conjunction with doing liposuction on small areas like face, neck and arms. It is a very versatile machine but it does require some minor surgical skills which his good for me because I don’t think they will be offering this at the gym across the street. Is there any technology that you're looking to purchase in the future? Do you have a guide to evaluating and purchasing technologies? I am looking into Vanquish because I can delegate this treatment to ancillary staff and it has no consumables. I am realizing that devices with high consumable costs leave no room for profit, and it is difficult to make patients happy because I cannot offer to retreat them for free if they don’t get the results they want. As a cosmetic surgeon, how will nonsurgical techniques impact invasive cosmetic techniques? Where do you think will cosmetic surgery evolve? Will it be changed by technology? I think we are moving more and more towards non-invasive and minimally invasive treatments. I can now offer my patients a realistic alternative to a facelift by using fat and fillers combined with skin tightening treatments. I think stem cell technology is become a big player in cosmetic medicine. Technology for harvesting stem cells from fat and peripheral blood is getting better and better. I think this is where we can see a lot of advances without running into ethical issues with fetal stem cells. If you could change one thing or correct one mistake in your career, which would it be? I think I bought too many machines. The lease payments on all the machines that I have are the biggest part of my overhead. If I could return all my machines except my ThermiRF device, I would have a very profitable practice doing injectables, fat transfers and skin tightening. What professional advice would you give to others who want to start a medspa based upon your experiences? Find a procedure that you enjoy and do very well and then promote yourself as the king or queen of that procedure. Don’t try to do everything and never compete on price. At first I didn’t understand what he meant, but after thinking about it I decided to raise the price. When I started charging enough to have a decent margin, I could afford to give free touch ups tell them “next time you will need more but this one is on me.” Patients were very happy to hear this. I lost some patients when I raised the price, but I gained many more who were not as price sensitive. 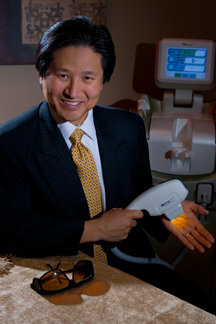 About: Dr. Hung William Song earned his undergraduate degree from Bucknell University. He graduated from University of Medicine and Dentistry of New Jersey -New Jersey Medical School. His internship and residency were completed at St. Lukes/Roosevelt Hospital New York, NY respectively.